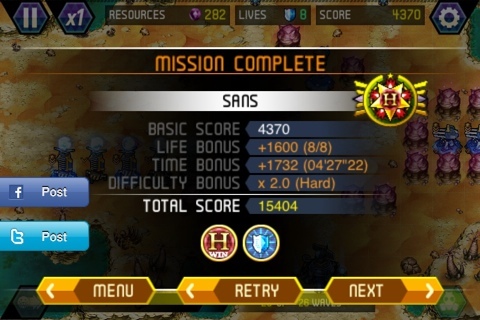 To complete this level on hard you should start by fully upgrading the scout tower which is built as you start. Laser towers cannot harm the pink blobs. But they can target them an fire at them as if they were able to cause harm. 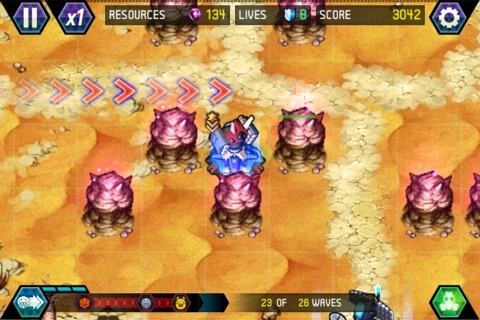 This level can be completed on hard by using this principle. 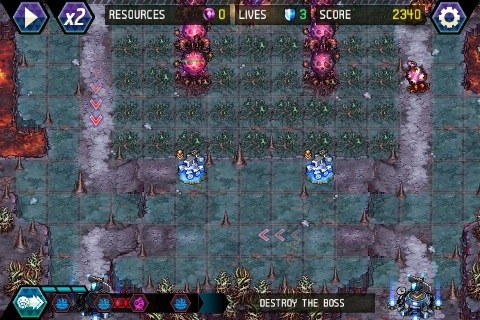 You’ll need to make room for two laser towers by building a scout tower and destroying the blob in the middle of the block, then the blob to the middle right. Make sure you then SELL this scout tower, otherwise you’ll destroy the pink blob which you need for the laser towers to target. Build your laser tower and target the blob to the left. I will not harm the blob but will rapidly send fire power down the centre line. Build another laser tower behind the first. 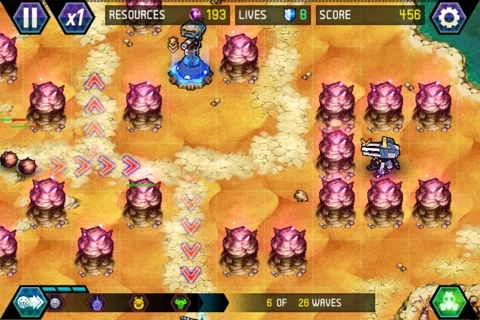 This second laser tower will target the blob. When you can, upgrade the laser towers. A splash tower here will help eliminate any enemies that might otherwise get through. 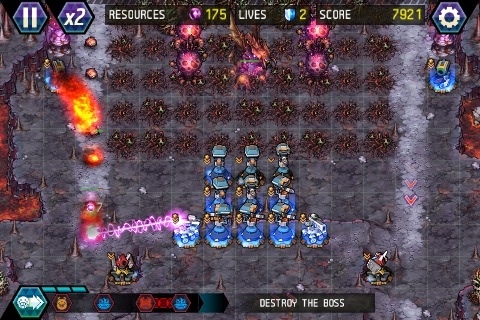 Build slow towers to slow the enemies down so that the laser towers will be able to shoot them more frequently. 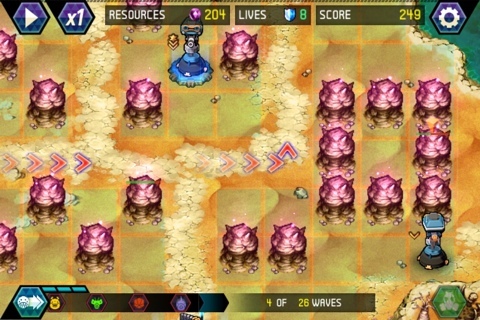 Upgrade the slow towers with the spare resources which you have. Scout Towers. 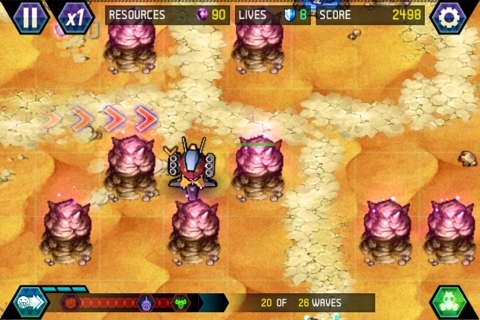 That’s the key to completing this map; without them you will not be able to reach the boss or the pink blobs beyond the first line. Start with two focus towers. 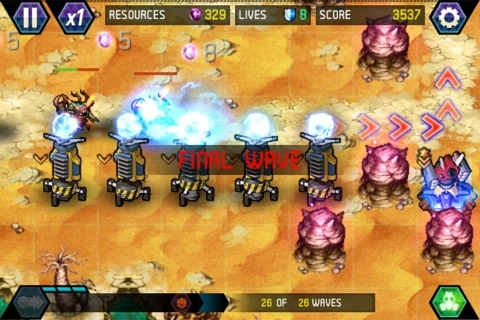 These will eliminate all the enemies for all of the first waves of enemies. Your first focus tower should be placed directly below the big pink blob on the left hand side. Start with one focus tower and when you have enough resources, build another one. Upgrade both of the focus towers to their maximum. These will be very effective and will allow you to start building the other towers which are needed to complete the level and the game. 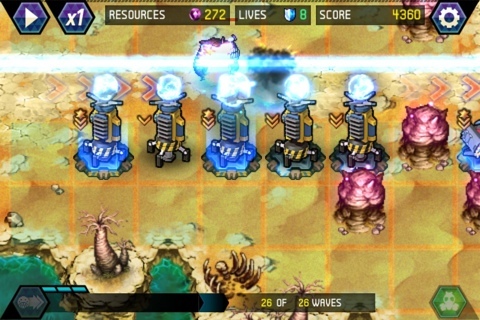 Once the focus towers are fully upgraded, build three scout towers between them and get them upgraded. Then start shooting the large pink blobs in front of the focus tower. It shouldn’t take long with your fully upgraded focus towers, but you’ll need to keep an eye on the enemies coming at you and switch your attention between them and the pink blobs. 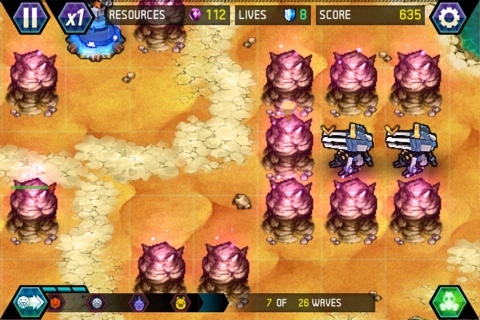 The blobs will give you 500 resources once defeated. 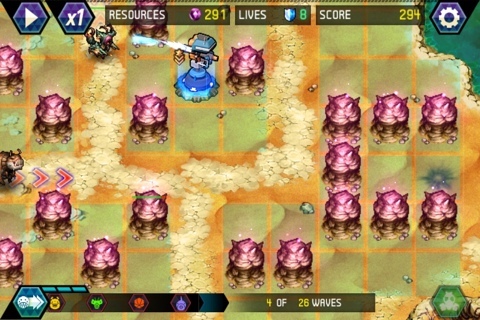 With this money build flame towers in the top right and left of the level. 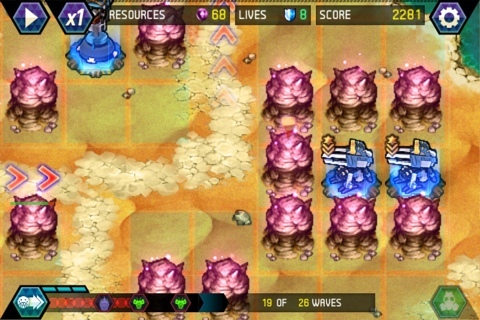 By upgrading these towers you can wipe off around half of all the enemies health before they get to your focus towers. Very handy. 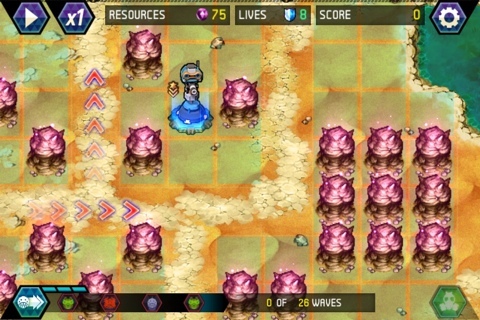 Once you’ve taken out the first two big pink blobs, build another line of three scout towers and repeat. 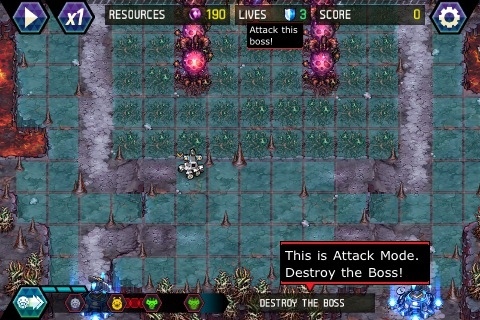 You’ll want to end up with a block of nine scout towers with the top line finally being able to reach the boss. Target the boss and in the meantime I built splash towers to help out and to catch any quick enemies from getting through. 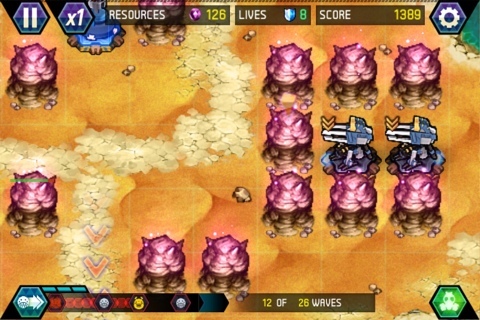 This is the set-up that allowed me to defeat this level. It’s hard. I had to again play it on x1 once then pink squids started coming, and I found it helpful to individually target the squids so they didn’t freeze the focus towers.